Bozeman, MT – Wildfires burning in Sonoma County, California have reinforced a good practice concerning emergency notifications for use here in Gallatin County. 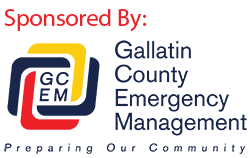 Providing fast, accurate and clear emergency messages during emergencies is often a complicated process that officials here in Gallatin County spend a lot of time preparing for. As reported by the Route Fifty on October 12th, Sonoma County officials debated the use of a federal system known as Wireless Emergency Alerts to notify individuals affected by the emerging wildfires. Sonoma officials ultimately decided not to use the system largely due to the inability to target only those people affected by the fires. “Many people have the impression that officials can send emergency messages to anyone, but the reality is that we can’t do that in practice,” stated Patrick Lonergan, Gallatin County Emergency Manager. Mr. Lonergan added, “Wireless Emergency Alerts will be a great tool in the future, but today it is significantly hindered in several key area. For example, using the Wireless Emergency Alert System we would have to send a message to every cell phone in Gallatin County even if the emergency only affected West Yellowstone. To compound this, the messages are limited to 90 characters and can not include website URLs.” These limitations make the system challenging to utilize and still provide a clear message while identifying who the message applies to.